Planning to spend your weekend by watching Shaadi Mein Zaroor Aana in the cinema near you? 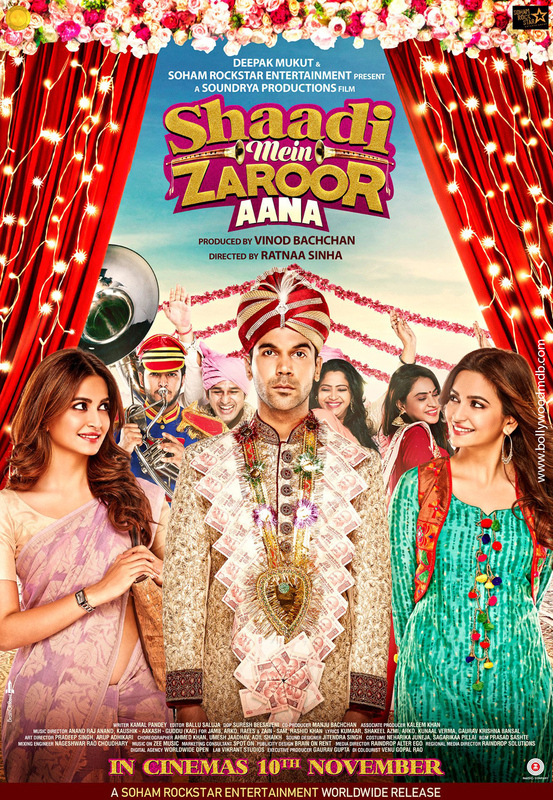 Read detailed Shaadi Mein Zaroor Aana movie review by BollywoodMDB before booking your ticket. A sweet romantic-revenge drama carried solely by Rajkummar Rao! Positive Points: Rajkummar Rao, the supporting cast and the first half of the movie. Negative Points: Kriti Kharbanda’s performance and the extended second half. The movie revolves around Satyendra aka Sattu (Rajkummar Rao), a newly appointed government clerk and Aarti Shukla (Kriti Kharbanda), the educated unemployed girl because of her father’s mentality that women should stay at home, meet for an arranged marriage. After spending some quality time, both fall for each other. The families of the two, despite having some dowry-related issues schedule their marriage. With a sudden twist and turn, Aarti runs away on the eve of her marriage to pursue her dreams of becoming a PCS officer. Both the families go in trauma/shock about the fear of society and their reputation. Both Sattu and Aarti never get the chance to discuss or confess the matter. After five years Sattu becomes IAS officer, who takes vengeance from Aarti for what she did five years back. Though the two get apart five years back, the love between them never ends and after successfully taking revenge from Aarti, which is fair enough as per the script, Sattu can’t see Aarti getting married again with some other guy. On the other hand, Aarti who accepts her mistake tries to convince Sattu to marry her again but Sattu being the egoistic and arrogant guy disallows her proposal each and every time. Though after seeing that Aarti is about to get married to another guy Sattu loses it and pleads before Aarti to marry him and not the other guy. Will there be a happy ending or the revenge saga ruin their love story? Satyendra, played by Rajkummar Rao nailed the role of a true lover, who takes vengeance after heartbreak. Kriti Kharbanda aka Aarti Shukla fails to convince the audience, though she has enough screen space, the pinch of Kanpuriya girl was missing from her character. The role of Sattu’s and Aarti’s father has been played by K.K. Raina and Govind Namdev respectively. Both the veterans justified their roles. Vipin Sharma and Manoj Pahwa played the role of mamaji’s of both the leads have some witty and bitter conversations in the movie. Both the mamaji’s perfectly played their part. Directed by Ratnaa Sinha, SMJA succeeds to show romance and revenge story but the movie has some loopholes too. Where Rajkummar’s and supporting casts’ placing is done top notch in the movie, Kriti’s role will still be incomplete for the audiences. The film sometimes gives the Sooraj Barjatya’s vibe, in the later second half, one can sense ‘Bareilly Ki Barfi’ moments. Despite having some talented star cast, the movie takes you to the 80’s and 90’s era. The storytelling isn’t gripping. For the movie buffs, the movie ends at the early second half, as after the interval, the movie was extended for no reason at all. The climax of the movie starts reflecting as soon as the revenge part gets over. So. the movie felt predictable. The music of the film is given by various artists. Each artist for each song. The movie has a total of 5 songs. Each song is placed at the right moment. ‘Pallo Latke’ plays at the end, while the other songs are played as the movie goes around. Though the songs are good, but not catchy. Only ‘Pallo Latke’ gives you some happy vibes. Despite having a few loopholes, the film will be received well by the masses only because of Rajkummar Rao. The Baaghi 2 trailer is here and it is a perfect blend of emotion, action and martial arts! Daas Dev Trailer: Promises to be an engrossing tale of love, addiction, and power!